For over a century, constant and/or intermittent skimming and removal of floating scum from the surface of process basins has been a necessity in municipal water and wastewater treatment processes. 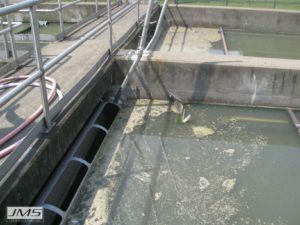 Historically, the most common method for accomplishing this has been the scum pipe system. Also called rotating scum pipes, scum skimmers, rotating pipes or rotating troughs, these systems are employed all over the world in circular and rectangular clarifiers, dissolved air flotation basins, settling basins, and other process basins where surface scum is an issue. Scum pipes represent one of the simplest and most economical ways to remove scum and other floating materials from the water surface. 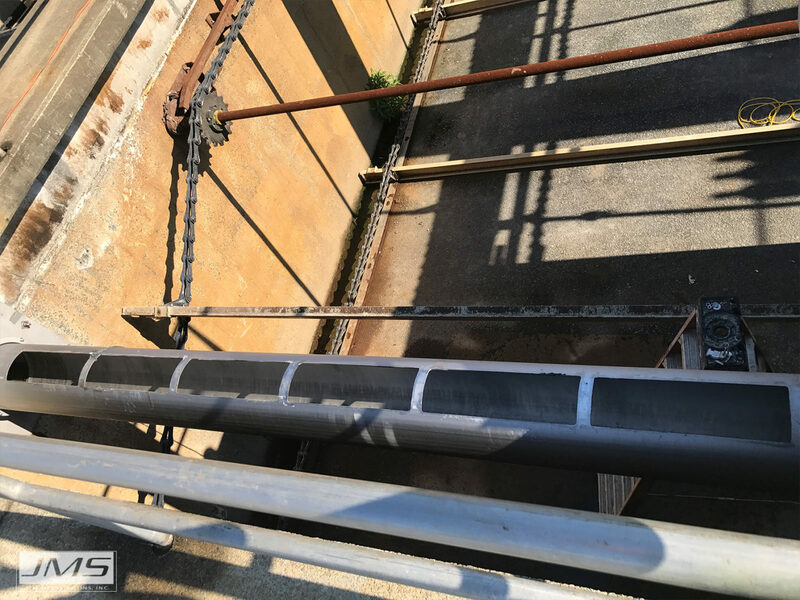 These slotted pipes rotate forward and backward by manual or electronic control, on a continuous or intermittent basis, and typically offer several other options as needed by the process. 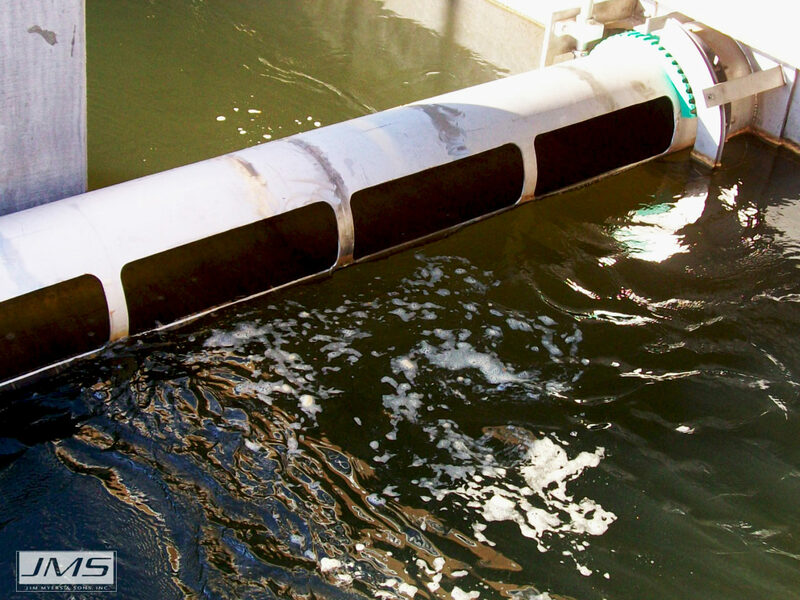 System design can accommodate various tank widths, water elevation levels, and desired operation frequency. 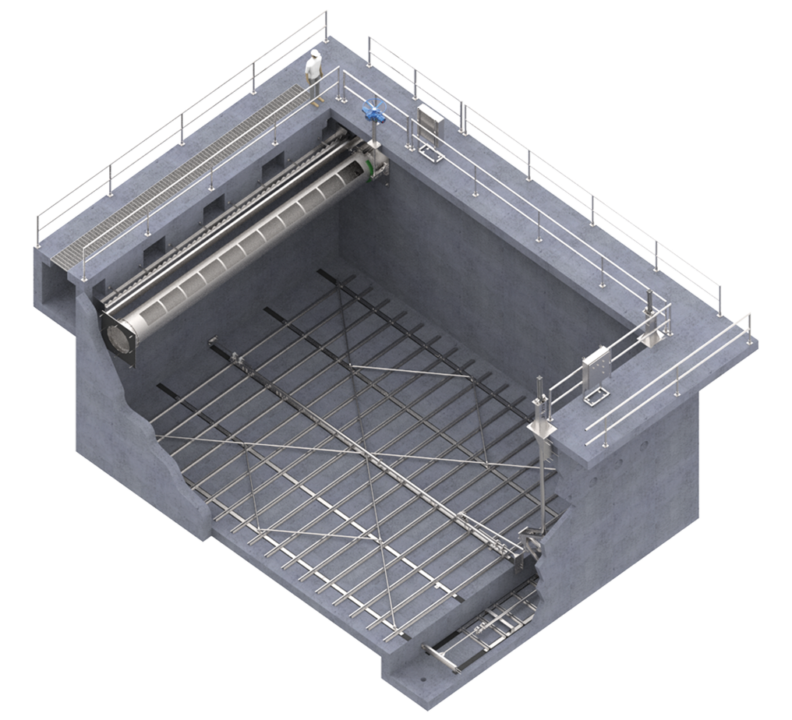 Important considerations include meeting maximum deflection criteria, pipe diameter and wall thickness, intermediate support needs, and method/mechanism for operation. Are you looking for what a typical scum pipe can cost? You can learn about that on the JMS Learning Center. 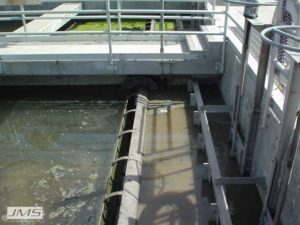 The worm gear assembly is employed by a handwheel or electric actuator to allow the Delta-SKIMMER (Scum Pipe System) rotate. JMS Drive Assemblies allow for flexible design to handle any needs and preferences from manual hand control to advanced automatic controls. 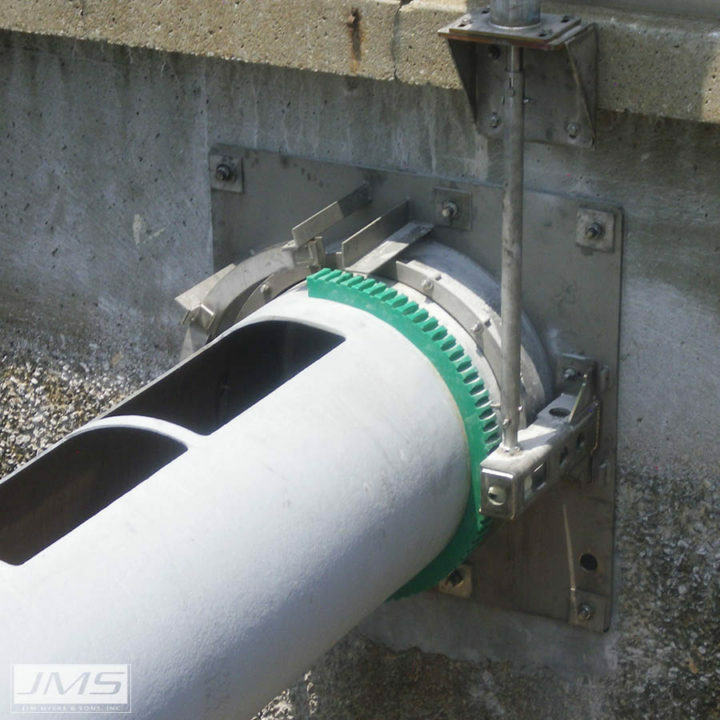 JMS wall bearing assemblies use water lubrication so that grease lines and lubrication are not needed. The seals are fully adjustable to allow for proper sealing without the use of grease, mild acids, or alkalis. 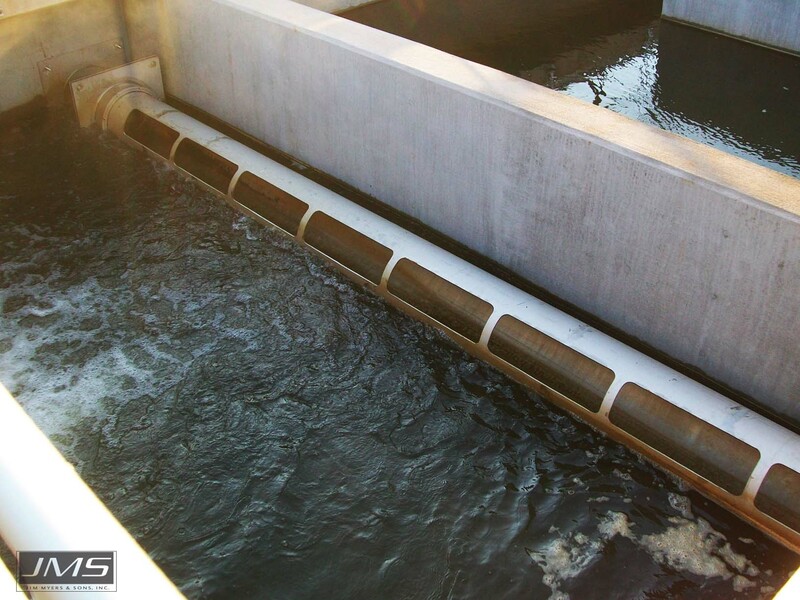 JMS has been providing scum pipes to the municipal water and wastewater industries for decades (in stainless steel T-316 or T-304, fiberglass, or carbon steel). Our Delta-SKIMMER (Scum Pipe System) uses proven proprietary JMS developments such as water lubricated bearings to eliminate the need for grease lines, and offers enhanced operation modes. 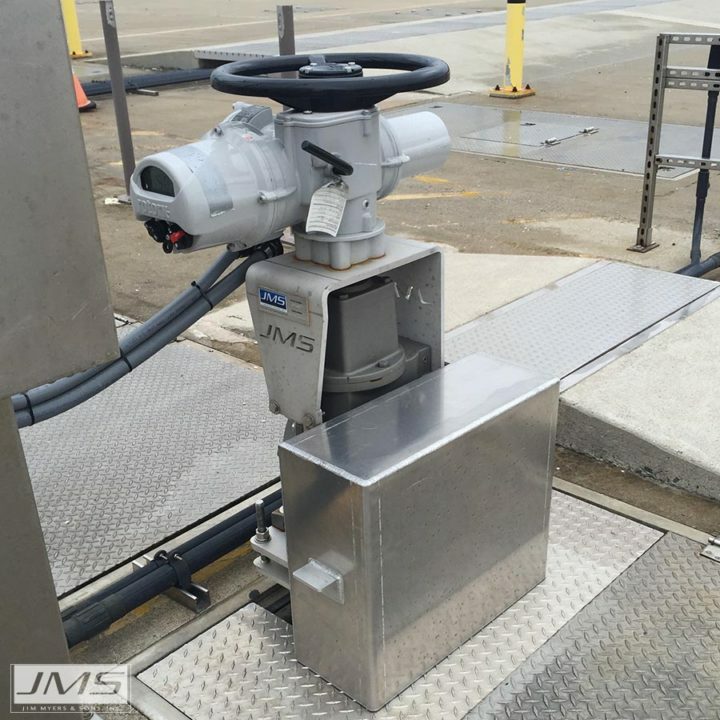 The JMS system approach includes supplying all mounting hardware, anchors and epoxy, all the way to sophisticated communication with SCADA control if desired. 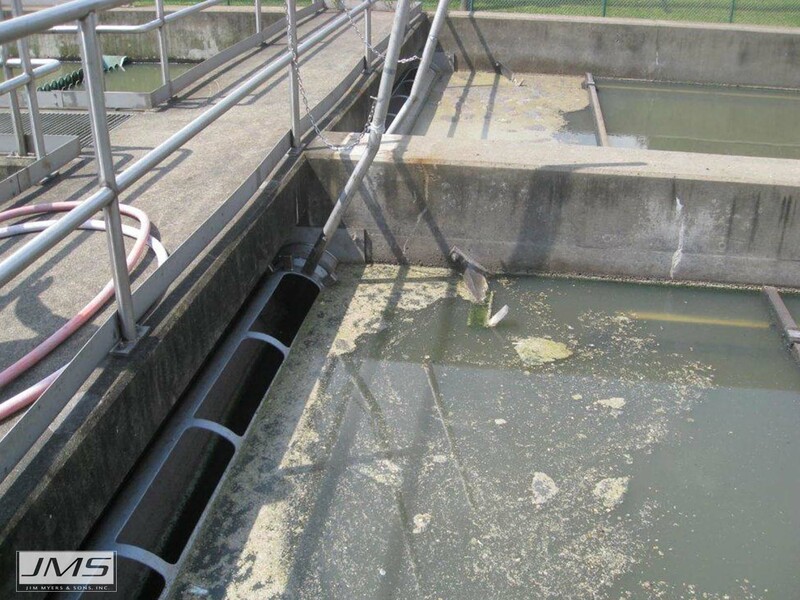 As a leader in this industry, each day, thousands of JMS Delta-SKIMMER (Scum Pipe Systems) are at work. 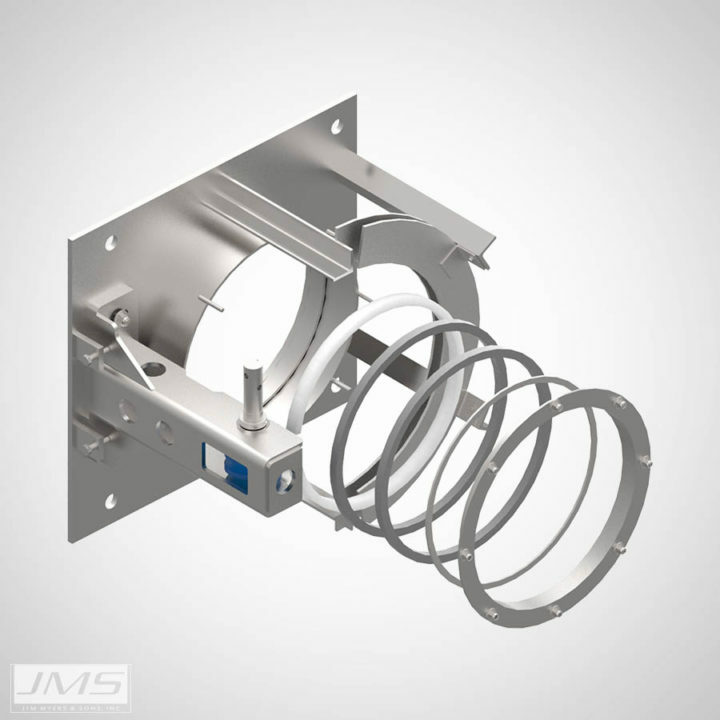 JMS wall bearing assemblies are water lubricated so grease lines and lubrication are not needed. End plate assemblies have 360° UHMW-PE bearings mounted internally for bearing support, and are inset to allow for seals. The seals are adjustable and are not affected by grease, mild acids or alkalis. 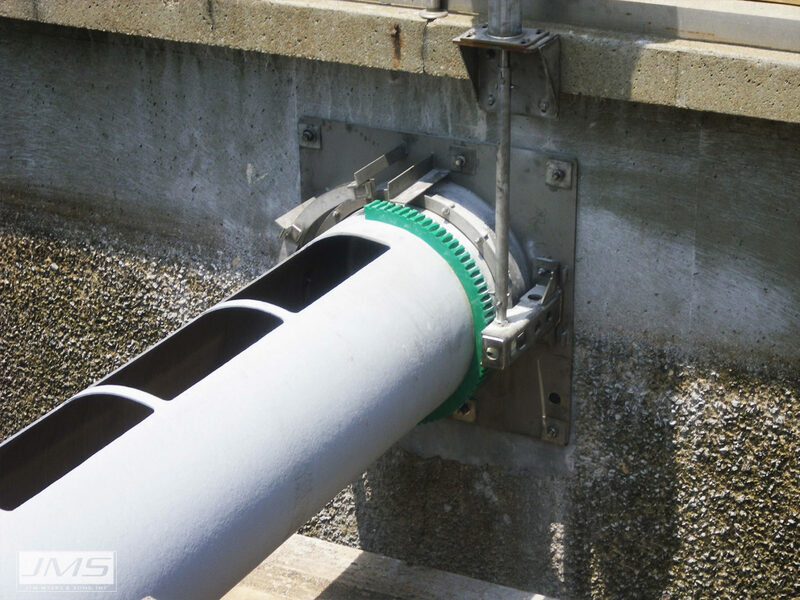 The seal assembly and packing is also removable without detaching the pipe from the supporting brackets, so no disassembly is required, a key operator consideration. Held in place by an external ring, it is designed to not interfere with the smooth action of the revolving pipe. 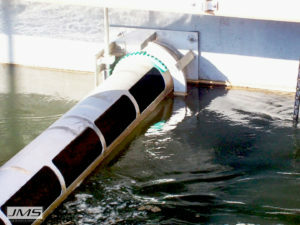 JMS Delta-SKIMMER (Scum Pipe System) are available with various operating mechanisms to suit the needs of the facility. Manual operation is accomplished by either a lever or handwheel, offering a low-cost solution. The handwheel can employ a worm gear and UHMW-PE gear rack operating mechanism (the most common) or a linkage type of operating mechanism. 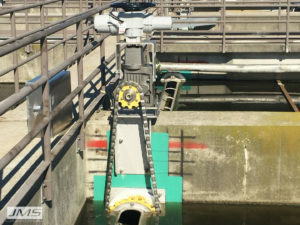 Automated operation can be achieved by employing an electric actuator. This scheme eliminates the need for manual operation, and can be operated locally or remotely through a SCADA or other PLC system. The actuator is mounted on a stand for operation through a worm gear or chain and sprocket mechanism. The actuator also includes integral controls, limit switches for position feedback, torque overload protection, starter, and a manual handwheel for backup. For throttling or modulating applications, analog control and feedback are essential. 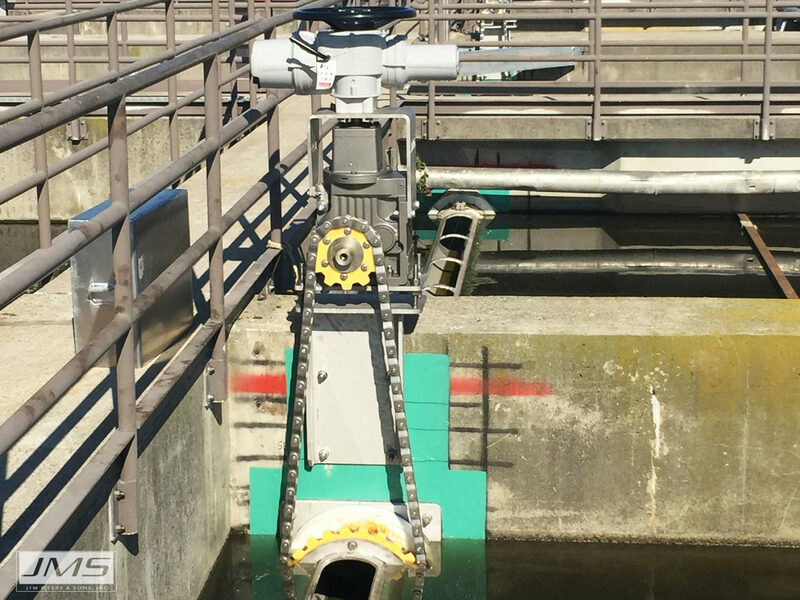 The JMS multi-position control feature option offers the ability to preset the 2-way rotation of the Delta-SKIMMER (Scum Pipe System) in up to four positions. The multi-position feature eliminates the added expense of analog field IO, logic controllers, and actuator hardware. 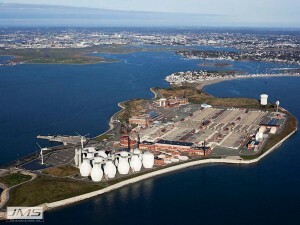 The Deer Island Treatment Plant is a large publicly owned Wastewater Treatment facility operated by the Mass. Water Resources Authority. 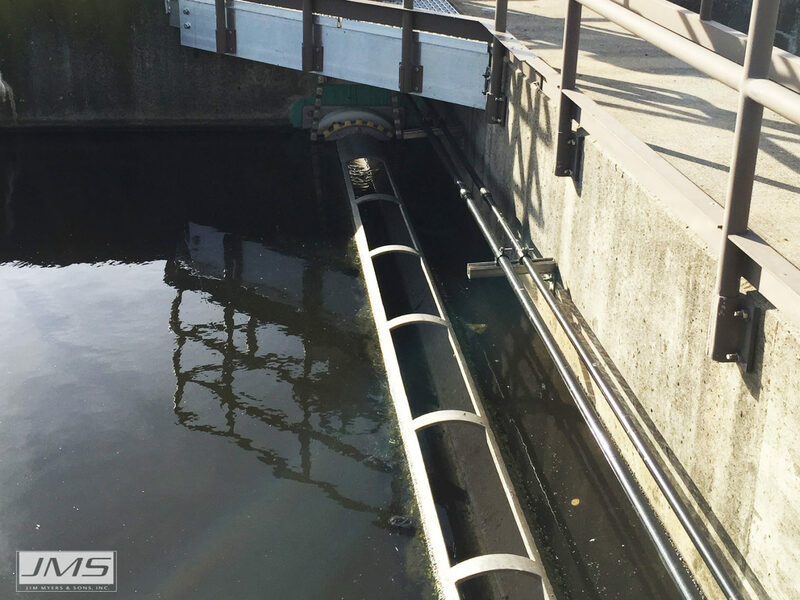 Located in Boston Harbor, it is the centerpiece of MWRA’s program to protect the Harbor from Metropolitan Boston’s sewer system. 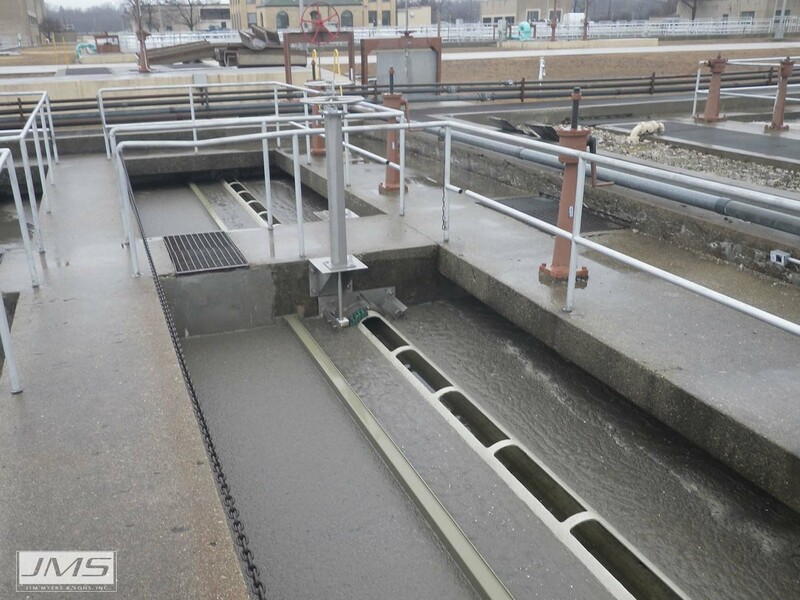 This plant is nearing completion of a transformation which will allow it to meet all EPA guidelines. 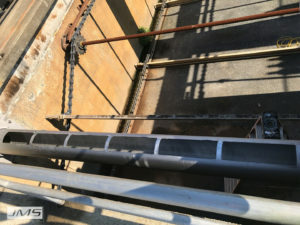 One of the many ongoing projects was the upgrade of the primary and secondary clarifiers, including the replacement of nearly 200 of the plant’s aged scum pipe assemblies. 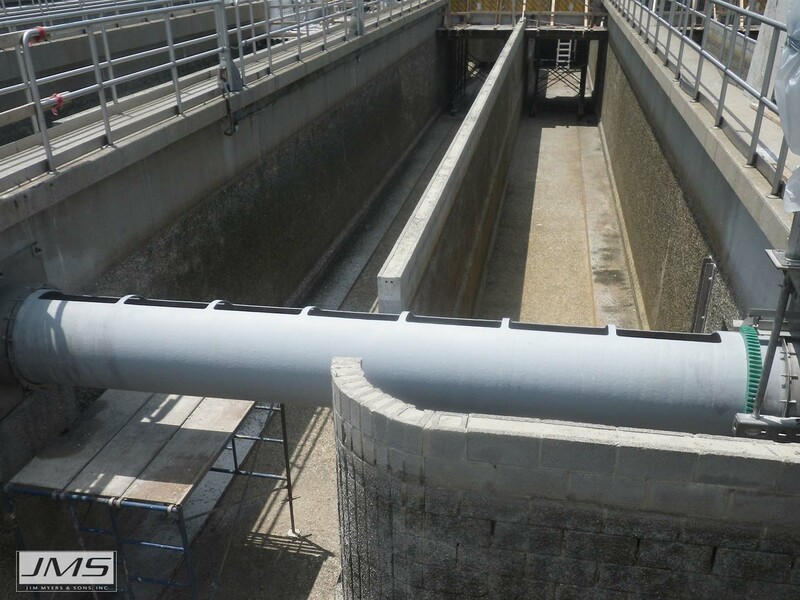 JMS worked with project designers for over one year to optimize the final equipment design which included JMS Delta-SKIMMER (Scum Pipe System) with chain and sprocket drive assemblies to increase long term reliability. As one of the largest projects in JMS history, results have been outstanding. After shipping over 500 tons of stainless steel components, JMS shipments were completed ahead of schedule. 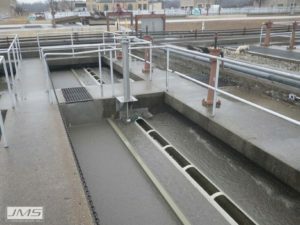 Carl Lindquist, Project Manager for MWRA and Resident Inspector, describes the JMS equipment as top quality, meeting all specifications, process compatible, and robust. In his words, the MWRA expects a long life and trouble free operation from this investment.